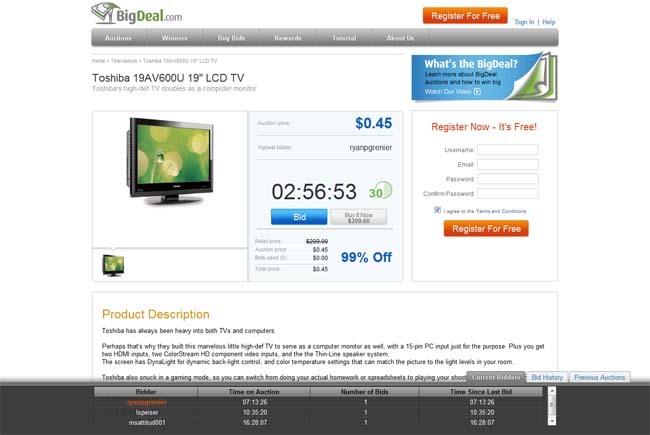 BigDeal lets users purchase virtual bids $0.75 each which can then be used to bid on goods ranging from video games to high-end televisions. Whenever you bid on an item, its price increases by $0.15 and an extra 30 seconds are tacked on to the duration of the auction. With this model, items end up selling substantially below their market value. But one of the main criticisms of Swoopo was the risk of losing your money spent on bids (regardless of whether you win or not) when the auction concludes. BigDeal takes a couple of steps to mitigate this risk. With BigDeal’s model, any users who get outbid get a full credit of the money uses for bids to buy the item via a “Buy Item Now” option (which Swoopo also has, called “Swoop-it-now”). So if you spent $10 on bids, your Buy It Now price will be dropped by $10. Of course, the Buy It Now price will frequently be higher than the price of item sold for in the auction but at least users aren’t necessarily losing money all together. And the Buy It Now price is set at the same price that Amazon lists for the same product. That’s not all. BigDeal provides an added incentive for bids by letting all users trade in the money they spent on bids for gift cards. All users get $1 gift card discount for every $1 spent on bids. So if you buy $25 in bids, BigDeal will give you a $100 gift card for $75.